From the very first page of The Red Lily Crown the tension and desperation dragged me in and wouldn't let go until the very end. Chiara and her family are in such dire straits when the story starts and her need to do anything to feed them was so admirable that I instantly fell in love with her as a character. She is also outspoken, stubborn and snarky and, as the story progresses, determined to grasp what power she can, making her a well rounded, relatable person. She sets out to use Grand Duke Francesco de Medici as much as he wishes to use her, helping him with his alchemical experiments in the hopes of ultimately creating the Philosopher's Stone so she can become an alchemist in her own right - something not many women could claim - as well as to heal her terrible headaches and the demon voices she had heard in her head since being kicked by a horse as a young child. This all seems like a good and manageable plan until she finds herself within the heart of the Medici family and she sees first hand just how corrupt, vicious and vindictive they really are. And that is when the fun really begins! Every single one of the Medici family are presented as absolutely terrifying and calculating in their own way. It becomes quite clear that none can be trusted, even when they seem relatively kind if spoiled as Isabella and her cousin Dianora come across, because every one of them will turn against anyone, even each other, to save their own skin and preserve or improve their power. Imprisonment, torture, even murder are not beyond their scope and the way they proceeded with such cool superiority no matter what diabolical act they had to sanction or do themselves chilled me. The descriptions of the violence and depravity are quite vivid and I couldn't help but keep reading to see just how far they would go. Watching Chiara slowly come to realize just how much danger she is in as the glittery film around the court falls away was mesmerizing and her growth and evolution so she was able to survive amidst all the manipulation and scheming was admirable. Another aspect I found just fascinating was how Elizabeth Loupas incorporated how the deep and long lasting damage of a bad childhood can come to affect a person as they get older. Each of our main characters - Chiara, Francesco and Ruanno - had scarring childhoods filled with abuse of one kind or another and the effects of that abuse followed them into their adulthood in some strange and horrible ways. It made me wonder what might have been different if these people had had the opportunity to be nurtured as they needed. While some of the characters, especially Francesco's younger brother Pietro, would most likely have been mad no matter what sort of childhood they had received, it did make me think about the whole nature/nurture discussion and to think what difference a positive childhood might have made to these people individually and for history. While the reader will learn in the author notes that Chiara and Ruanno are fictional characters the Medici were very real and therefore might have been very difference given the circumstances. Although as deep as the craziness seemed to go possibly not. Lastly, the slow, somewhat twisting yet satisfying relationship that developed between Chiara and Ruanno was very enjoyable to experience. With all the backstabbing going on you couldn't help but feel for Chiara as she tried to figure out how much she could trust Ruanno, a man who clearly hid many secrets of his own. I couldn't help but hope that Chiara would be able to find someone she could trust implicitly and whom she could count on to help her navigate through this treacherous landscape and hopefully be there for her if she was able to make it out safely. Did she find this someone? You will have to read the book to find out! 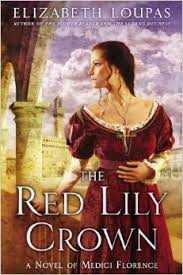 The Red Lily Crown has all the components I love in my historical fiction: historically accurate settings and people, intriguing and enigmatic characters, strong descriptions that allow me to feel like I am in the midst of the story and not reading it and, ultimately, a storyline that draws me in and holds my attention until the last page. Having previously read and enjoyed The Last Duchess by Ms. Loupas and now having enjoyed this book so much, I am a forever fan and am so excited to have found another author to keep on my radar. My copy is an ARC with a simple cream cover with black lettering but I absolutely adore the cover of the finished book! I can't get enough of covers showcasing the main character in all their finery against a historic background that fits into the story. I love the colors, the dress...everything. This is the kind of cover that grabs me every time! I loved The Second Duchess and am looking forward to reading this one - glad to hear you enjoyed it! Thanks Daphne! I hope you love it too when you get the chance to read it!